Yes time to talk about the classifieds, why did I not include this with the craigslist since it is also the classifieds? Well I separated them because unlike craiglist your local classifieds such as American Classifieds or your towns newspaper charges to have ads printed. If you are wondering why this matters it is cause if someone paid to post an ad that means they really do want to get rid of what they have. 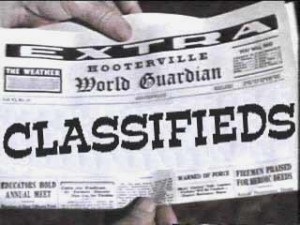 These types of classified do offer free posting but only online and typically if your not in a larger city such as Dallas you will not find much of anything in them if they even had anything in the musical instruments section. It may not be true for people selling cars and such but when it comes to cheaper things such as musical instruments these people are in my experience easier to haggle with. The problem though is that people who paid to print there ad are much less likely to deliver the item which can be a problem if they live on the other side of your town or outside of town. And they usually will never trade cause the sole reason they posted was strictly for money. As you can tell this section is short, there is not much to be said that doesnt carry over from the craigslist page.